I’m a big fan of polyester tennis strings. So, you can imagine that I was more than excited to have the chance to review a set of Genesis Black Magic 17. 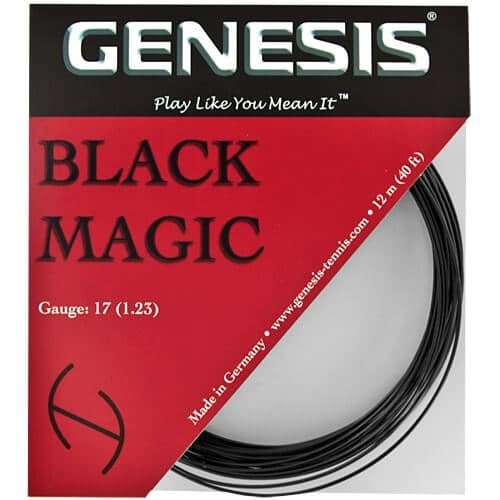 I have heard of Genesis and their Black Magic strings and I have read many mixed reviews, some say lots of spin, others say more power and control, while other say that the string is extremely comfortable. I was looking forward to installing the string and giving it my full review. As you know, I install all of my own strings, so I can review the stringing process of each string. The Black Magic was a little more on the challenging side of stringing. I don’t pre-stretch so there was more coil memory than I prefer. Basically, because I didn’t stretch out this poly, the coils from packaging stayed and caused many interwoven loops, which I had to spend extra time untangling. Once I got past the tangles, stringing the Black Magic was not too bad; I didn’t encounter any twists, kinks, or anything of the sort. It weaved nicely into my Donnay and the knots were a snap. I used a reference tension of 48lbs in a full bed (two-piece). I was ready for the courts! When I was able to fully test the string, I knew I had a string in my tennis racquet that could allow me to play some great tennis. At first, the Black Magic felt very soft, something I like in a string. A soft polyester gives me a chance to get a slight advantage on feel. Because I strung at a higher than normal tension (for me) I, at first, could not get the pocketing that I am used to. Though, it eventually came, after the strings settled in my racquet. Because the Black Magic is so soft, I enjoyed going after my forehand side, I was confident in being aggressive when I had the opportunity, knowing that I would not injure my arm (especially since I was already coming off a tender elbow). As I spent more time with the strings, I discovered some flaws, not deal breakers, but flaws nonetheless. This string is under powered. I know, polyester tennis strings are all generally low powered strings, but the Black Magic was one of the lowest powered strings I have tested. Not the lowest, but certainly one that I had to work extra hard to generate depth and speed from my groundstrokes. I am strong enough and my technique is solid enough to create power when I need to, but I found that I was worn out much faster because I had to put in the extra effort. No harm in burning extra calories though, right? The other flaw was the spin. This is not a spin monster. Don’t get me wrong, I am not saying that there is absolutely no spin, I’m just saying that this string does not enhance, change, or add more spin on it’s own, it’s something that every player will have to come to the table with. I do enjoy hitting with top spin, though I ultimately struggled to get that kicking spin that some of the other polyester strings I’ve tested can produce. Even though the Black Magic was low powered and not super spin friendly, I did quite enjoy the control I was able to find with this string. Playing placement shots with my groundstrokes was an absolute delight! I could almost place the tennis ball within a few inches of where I hit it on the previous shot, cross court or down the line. It was just very simple, especially considering I play with an open string pattern (16×19). The control really helped me achieve some great placement serves. Even if they were not as spinny as I like, the pinpoint accuracy of the string let me go where I needed to counterbalance the lack of kick and slice. I did, at times, have to put in some extra effort when trying to generate some extra MPH’s, but in the end, I pulled out the points when I needed them and held serve. I played these strings for a good 5 hours (about 2.5 hitting sessions) before they fell off the deep end and became unplayable. It was a shame too, they played nicely until that time. As soon as they reached the dead point, it was really dead. Not a slow death, I’m talking balls flying everywhere, and error after error piled up. The feel was gone and what little spin I was able to get was absolutely non-existent. The 5-ish hours I got from the BM was a little disappointing; polys generally are pretty durable and maintain their tension, I didn’t find this to be true with the Black Magic. As soon as I got home, I cut them out. The bottom line is, this is a very nice string. It’s a nice offering and could be a nice hybrid setup if I were to use a synthetic or natural gut in the crosses. I wouldn’t change the tension much; maybe drop it by a couple of pounds to try to get a little extra pop. And, even though there was a lack of spin, it provided enough spin to keep the topspin forehands in the court. All in all, I would absolutely use this tennis string again if I had the chance. This is by far one of the nicer feeling polyester tennis on the market, it’s soft and the ball comes off the stringbed beautifully. Definitely a must try for the tennis player who suffers from tennis elbow or has other arm issues.